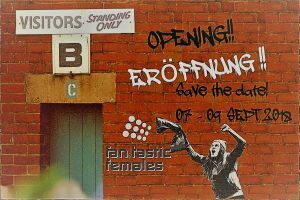 After more than one year of work on the project, we are thrilled to be able to announce the date for the launch of the Fan.Tastic Females: the exhibition will be shown for the first time on the weekend of 7-9 September in Hamburg / Germany! Further details will be announced as soon as possible. There are still a few bits and bobs to do until the opening… Hence, if you want to support us coming down the home stretch - the more we are, the better! Click here to find out how you can help! Other than that, save the date and stay tuned!